Sherwood Forest Lodge in Kings Clipstone, near Mansfield, Nottinghamshire sleeps 4 people. Sherwood Forest Lodge near Mansfield is ideal for cyclists and walkers; this very smart, single-storey, detached lodge offers direct access to the National Cycle Trail and is adjacent to the expanse of Sherwood Pines and Sherwood Forest. 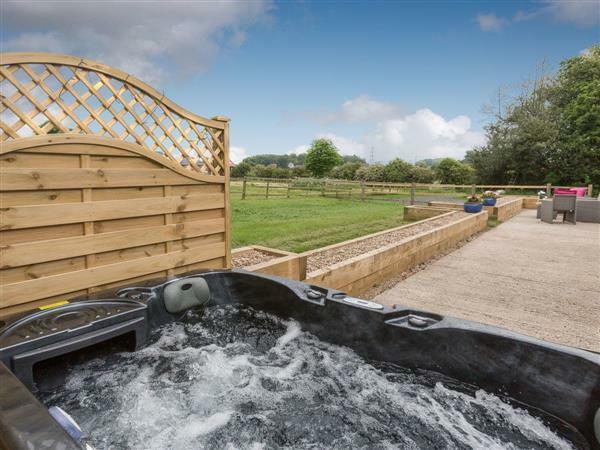 Enjoying a unique situation, this holiday property benefits from a patio with private hot tub. Sherwood Forest Lodge makes a wonderful base for exploring the surrounding county, and adjoins the ruins of King John’s Castle. There are numerous attractions in the area, including Go Ape, go-karting, a public swimming pool, crown green bowling, a gymnasium, and within a few miles, Rufford Abbey and Clumber Park (National Trust). The grand houses of Hardwick Hall, Newstead Abbey and Bolsover Castle are within 25 minutes’ drive. The Sherwood Forest Steam Railway and White Post Modern Farm will delight guests of all ages, and golf and horse riding are available 2 miles away. The shop is 1½ miles from Sherwood Forest Lodge near Mansfield, with the pub and restaurant ½ mile from Sherwood Forest Lodge. Living area: With 32 Sky TV, DVD player and CD player. Kitchen area: With breakfast bar, electric oven, electric hob, microwave, fridge, freezer and dishwasher. Bedroom 1: With king-size bed, Sky TV and en-suite with shower cubicle and toilet. Bedroom 2: With double bed, Sky TV and en-suite with shower cubicle and toilet. Gas underfloor central heating, electricity, bed linen, towels and Wi-Fi included. Welcome pack. Enclosed, lawned garden with patio, garden furniture and barbecue. Hot tub for 4 (private). Private parking for 2 cars. No smoking. Holidays at Sherwood Forest Lodge run from Friday to Friday. For a better idea of where Sherwood Forest Lodge is, you can see Sherwood Forest Lodge on the map below. Sherwood Forest Lodge is in Nottinghamshire; should you be on the lookout for a special offer, you can find all the special offers in Nottinghamshire. It's always worth checking to see what is on offer at the moment. Do you want to holiday near Sherwood Forest Lodge (UKC3274), you can see other cottages within 25 miles of Sherwood Forest Lodge; have a look to find your perfect holiday location.